Around Martin Luther King Day, my 3-year-old daughter’s preschool class talked about their dreams. My daughter’s dream was: “One day I want to work in a soup kitchen.” Well, there is one proud mama here, let me tell you. But I must give credit where credit is due – to Uncle Willie. 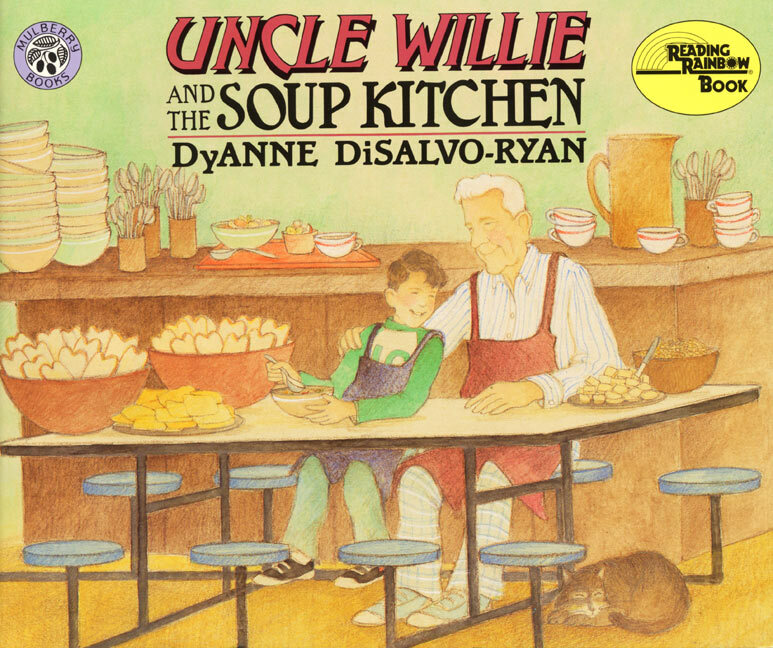 We got our daughter the Reading Rainbow book Uncle Willie and the Soup Kitchen (Amazon affiliate link) as a way to explain homelessness, something we encounter fairly often in our urban neighborhood. 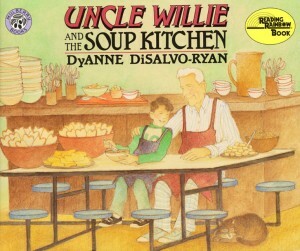 Uncle Willie manages a soup kitchen and brings his nephew along one day to help. Through the nephew’s eyes, we are exposed to people who sleep on park benches, people who collect aluminum cans from trash bins, and people who come to a soup kitchen for their meals. The nephew makes observations along the way, such as that the woman sleeping on the park bench must be lonely, and that there are high chairs in the soup kitchen so even babies must come sometimes. What I love about this book is how straightforward it is. Homelessness is addressed in a kind, but not patronizing or judgmental way. Uncle Willie speaks to all of the people in a friendly and respectful manner and clearly loves his job. The Amazon review describes it well: “A straightforward fictional view of an urban soup kitchen, as observed by a boy visiting it with his ‘Uncle Willie,’ who works there every day….The difficult lives of those fed (including children)–as well as the friendly, nonintrusive attitude of the kitchen workers toward them–are presented sensitively but without sentimentality.” This book helps my daughter to process homelessness in her own way. She will often use this to expand the conversation. For example, are there beds at the soup kitchen? And she has come up with creative solutions to homelessness, such as when the subway is closed at night, the homeless can sleep on the trains. One part of the book catches us everytime. Chickens are donated from a local butcher and there is big excitement about how wonderful it will be to serve chicken and vegetable soup. My daughter likes us to change the words so that we can pretend they are serving vegetarian food, which is a great solution for now. I’m looking forward to the kinds of conversations that this will spark in the future. As vegetarian families, it’s often difficult to volunteer in a soup kitchen because typically meat is served. We have to decide if it’s worth putting aside our belief in helping animals in order to help hungry people, and that’s a difficult decision. Although there are vegan soup kitchen, they are few and far between. The one in our neighborhood is most certainly not vegan. I’m happy to have this book on our bookshelf. It’s a great introduction to homelessness. It’s perfect for young minds to begin to understand the issues, and a great jumping off point for deeper conversations. I highly recommend this book, especially to those living in urban environments where homelessness is a part of our daily lives. We’re so glad that this is a topic being addressed in an age-appropriate way. We’re exploring the shared experience of interspecies homelessness, between those people living on the streets and their animal companions, in our Summer/Fall exhibit: “My Dog is My Home”. Did this book include a look at homeless interspecies families? What we’re finding is that many such families are denied services because animals are a part of the equation. No, it doesn’t touch on animal homelessness or animal companions of homeless people. Thanks fo the tip.